The market got a slap upside the head to end the trading week. Relentless selling took the Nasdaq down by 3.77% and the S&P 500 Index by 2.46%. At the NYSE, over 93% of the volume was in declining stocks, while at the Nasdaq the number was only 92%. Any way you slice it, Friday’s market action was devastating to the bulls. Or was it? Since this looks like a runaway freight train, what I’m saying it may seem crazy. But let’s put emotion away for a moment and use technical analysis. Also, according to other research by Lowry’s, whenever we have less than 10% of stocks trading above their 10 day average, we have a setup for a rally. And surprisingly, not just a short lived one. Because of Friday’s brutal sell off, we now have less than 6% of S&P 500 stocks treading above their short term moving average. I’ve mentioned this lesser known indicator before a few times. The New High Low Index relies on the number of stocks making new highs and lows and so it is a great measure of oversold/overbought in the market. Right now it is incredibly low - signaling that we are very close to an intermediate low. The retail option traders, as measured by the ISEE Index, have already begun to push back from the call buying frenzy they were on. And I suspect on Monday, they will get scared even more. The same can be said for the more commonly followed CBOE put/call ratio. 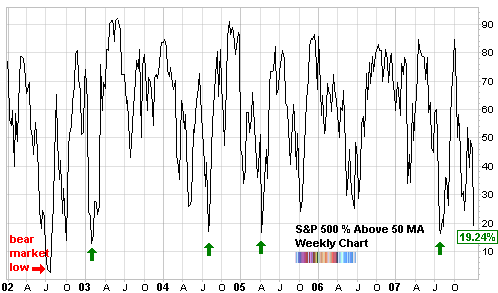 The chart below shows the percentage of stocks (S&P 500) above their 50 day moving average. As you’ll notice, every time this dips below 20%, we have a buying opportunity on our hands. It can go all the way to zero but it rarely does. The last time it approached the lower limit was in the darkest days of the bear market. Similar to the chart above, only 10% of the Dow Industrial stocks still remain above their 50 day moving averages. This is the oversold level reached in March 2007 and August 2007. Obviously, both were fantastic buy points. If you’ve been reading the blog, then you know that we’ve been getting a lot of these oversold readings lately. Intuitive thinking would say that whenever we get a series of oversold signals from these and other technical studies, the market is weak and about to “break”. In fact, the opposite is true. For example, all through the summer of 2006 there were a bunch of oversold readings close to each other. Shortly after, the rally took the market to new 52 week highs. Now that we’re done (almost), let’s bring out emotion again, but this time, put it to use for us - instead of against us: Weekly Sentiment Overview.